(n) the endurance of pain or hardship without the display of feelings and without complaint. I have been reading different philosophies for the past few months now. And, I am amazed at knowing the deeper reasons behind most of the philosophies. To start with it, I first read a basic philosophy book titled “Myths are Real, Reality is a Myth”. If anyone wants to try philosophy genre, this book is recommended for the starters. I have written about Minimalism in detail here. Philosophies teach us the art of living. Stoicism, in particular, is a way of living your life peacefully, with the use of proper logical thinking in your day-to-day life. According to its teachings, as social beings, the path to happiness for humans is found in accepting this moment as it presents itself, by not allowing ourselves to be controlled by our desire for pleasure or our fear of pain, by using our minds to understand the world around us and to do our part in nature’s plan, and by working together and treating others in a fair and just manner. It looks quite simple, right? Till then, I’d suggest you keep a check on your thoughts. Are there some problems in your life that you can’t resolve, but you keep on worrying about them? 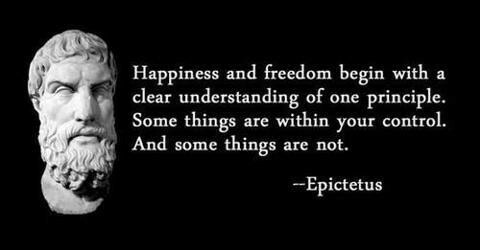 Stoicism, for me, is ignoring those unsolvable problems, and focusing on what we can actually control in our lives.